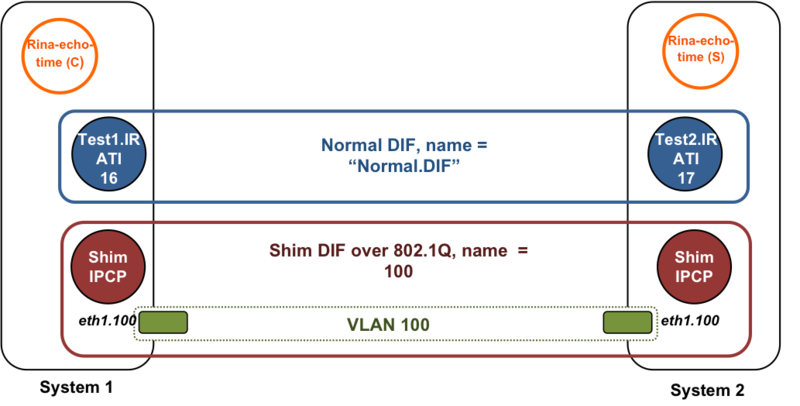 This tutorial explains how to configure IRATI to instantiate a normal DIF spanning two machines (systems) interconnected by a VLAN, as illustrated in Figure 1. Assumptions: IRATI has been successfully installed in the system as explained in How to install the IRATI stack. The software is assumed to have been installed in $INSTALLATION_PATH. NOTE: If you are installing IRATI in a VirtualBox VM, please do not use the Intel PRO/1000 net card adaptor since it strips the VLAN tags. For this simple experiment we will use the shim DIF over 802.1q and the normal DIF, therefore we need to load the modules that provide kernel support for these functionalities. Once the configuration file has the adequate contents, we can start the IPC Manager Daemon, which will trigger the creation of the two IPC Processes and assignment to its respective DIF as specified in the configuration file. To do so, we have to enter the following command in the $INSTALLATION_PATH/bin folder. You can obtain more information about a NORMAL IPC Process by using the query-rib command (not supported by shim IPC Processes yet). By examining this information we can look at the naming and addressing properties of the IPC Process, the configuration of the DIF policies, its neighbors, the registrations to N-1 DIFs, the N-1 Flows it currently relies on, the N-flows it provides to applications, etc. You can exit the IPC Manager console via the ´exit´ or ´quit´ commands. Now we have two IPC Processes in two systems that belong to the normal DIF but they don't know about the existence of each other. In order to so, we have to trigger the enrollment procedure, which will make both IPC Processes to discover each other and to become neighbours in the normal DIF. We will trigger the enrollment procedure via the IPC Manager console of System 1 (could also be done from System 2 with a dual procedure). We will now use the rina-echo-time application in 'ping' mode to test a flow over the normal DIF. This application consists in two types of processes: servers and clients. In the 'ping' mode, the client sends a configurable number of packets (SDUs) at a configurable rate to the server, which echoes them back. The client reports the latency it perceives. Note that the IPC Process test2.IRATI has disseminated the registration of this application through the DIF, therefore the RIB of test1.IRATI will also contain this entry. If you inspect the RIB of any of the two IPC Processes, you will be able to see a new entry describing the flow supported by the normal DIF.